3D LUT Creator is a very powerful color editing and LUT generating tool. 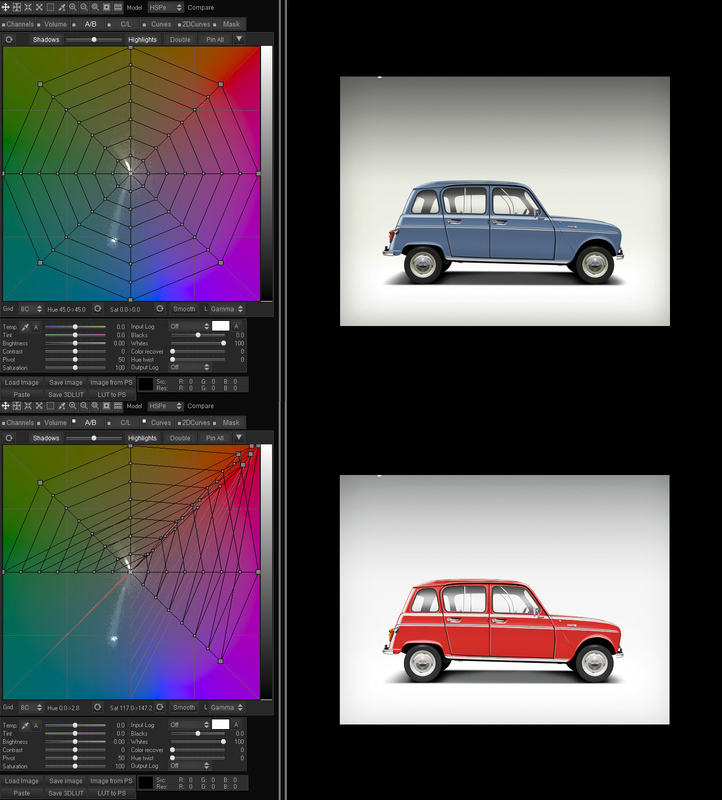 It is not simply a color selection and manipulation tool. Watch the collection of videos on YouTube detailing the various functions and features of 3DLC and I think you will find that to try to incorporate it's functionality into AP is not possible. Give the application a trial too - you might find it is worth the investment. And I would not expect affinity photo to do it all/ do. it exactly the same way. But definitely good as a starting point, to implement a simplified version of it together with other options. 300€ for this usecase are out of scope for me at the moment, I would rather learn to use Davnci resolve as it has proper masking e.g. as well. I think it should not be so complicated to implement the basics of LUT in general. It's just swapping RGB value, similar like Hue/saturation adjustment layer, just a little bit profine. A LUT is basically just a baked color correction or color transform. You can think of it as a pre-computed color correction preset. Despite the slightly misleading name, 3D LUT Creator has little to do with LUTs, it's basically just its method of exchanging corrections with other software. DaVinci Resolve is more like Lightroom for cinema, whereas 3D LUT Creator can be thought of more like a Lightroom or Photoshop plugin. It's not a question of learning one or the other as they are completely different programs. Affinity Photo already has support for 3D LUTs. It's implemented as an adjustment layer like in Photoshop and allows you to open and apply 3D LUT files, and also to save color adjustments made inside Affinity to LUT files. Though I vaguely remember something being slightly broken in Affinity's LUT support last time I checked. The Linear color matrix and grayscale conversion editing using a triangle (seems like it's interpreting the components of the color matrix as barycentric coordinates so you can essentially move corner points of a triangle to edit the matrix). I'd love to see this as a new adjustment layer type. The color chart matching tool, including the option to create custom presets. Resolve has a rudimentary version of this as well, but allows no custom targets. Adobe software needs clumsy third party workarounds like XRite Color Checker etc. that output custom ACR camera calibration profiles for every shooting situation. 3D LUT Creator's tools are great to create LUTs to match color reproduction from different cameras, whereas the XRite/Adobe hack only lets you neutralize it. As far as I am concerned, these things would be spectacularly useful to have in a software like Affinity Photo. Despite the slightly misleading name, 3D LUT Creator has little to do with LUTs, it's basically just its method of exchanging corrections with other software. 3DLUT Creator creates 3D LUTs based on all of the tools and corrections within the application. Have you ever used it? I'm not sure I understand your characterization of it here. When talking about a LUT editor, usually you'd think of a tool that does things like resampling, converting between LUT file formats, generating LUTs to transform between color spaces and tone curves (say, F-Log to Rec709 or similar), generate inverse LUTs, combine them, convert between ICC profiles and 3D Luts etc., similar to the excellent Latice for example. While 3D LUT Creator can load and save LUTs, its main appeal are its rather advanced color correction features, most of which actually have very little to do with actual LUTs and could be implemented without ever touching a single 3D LUT file (some of the color space mesh warps use similar concepts, though). The software just happens to allow you to save these corrections out as LUTs. 3D LUT Creator is essentially a standalone image editor with 3D LUT support. As such, asking for a "3D Lut Editor" feature in Affinity Photo is not really the right request if we are looking for the color correction features similar to 3D LUT Creator. It's a bit like asking for a PDF editor when you are really interested in page layout features. That's all I'm saying. I have indeed tried the software a few times in the past and seriously considered buying it, as I think its unique color correction tools are extremely useful, but I found it way too unstable for now (at least under OS X). I understand and appreciate the distinction you are making, but all of that can be done in 3DLC. Lattice is a nice tool as well and is useful for manipulating transforms and creating new ones based on color models and tone curves - I especially like the ability to write expressions to define transforms. 3DLC permits manipulations of LUTs (although not with the expression-driven Lattice-like approach) as well as its ability to edit color and tone with its unique set of tools. In this sense, I think it offers more than simply saving image edits in a LUT format. AP already will permit much of the Lattice-like LUT transform (input to output) in the form of OCIO support in an adjustment layer. It would appear (and I could very well be wrong) that the OP is looking for the color correction tools in 3DLC, not an explicit LUT editor like Lattice. Did you write it color correction tool? Please read the first quote to get the answer. 3D LUT Creator change the values of color #444444 to #100100, it's similar to Hue/saturation tool just more advanced. To compare it it's like Level tool & Curves tool, for sure curve tool is more advanced. All he needs is AP's API specification.